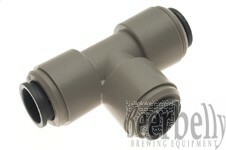 JG 5/16" T Piece Splitter Quality Home Brewing Supplies and Equipment, Adelaide - South Australia. We ship to your door Australia Wide. Split line into 2 and sends them in opposite directions. Split gas line from 1 regulator into 2 kegs or get two splitters and split into 3 kegs. Push in connections, easily removable. Fits 8mm outer diameter tubing.